This year it felt like retailers really didn’t get into the Valentines Day spirit. I didn’t see very many outfits with hearts or lips and very few red or pink dresses. Also, being a curvy girl I found the selection of Valentines Day outfit sizing to be on the smaller side this year and although I waited till it was nearly too late in the hopes that my go-to brands would come out with something, they didn’t, so, I decided I’d reach into my fabulous wardrobe and put my own Valentine inspired outfit together. For those that have followed my blog for a while you know how much I love themed and novelty prints. 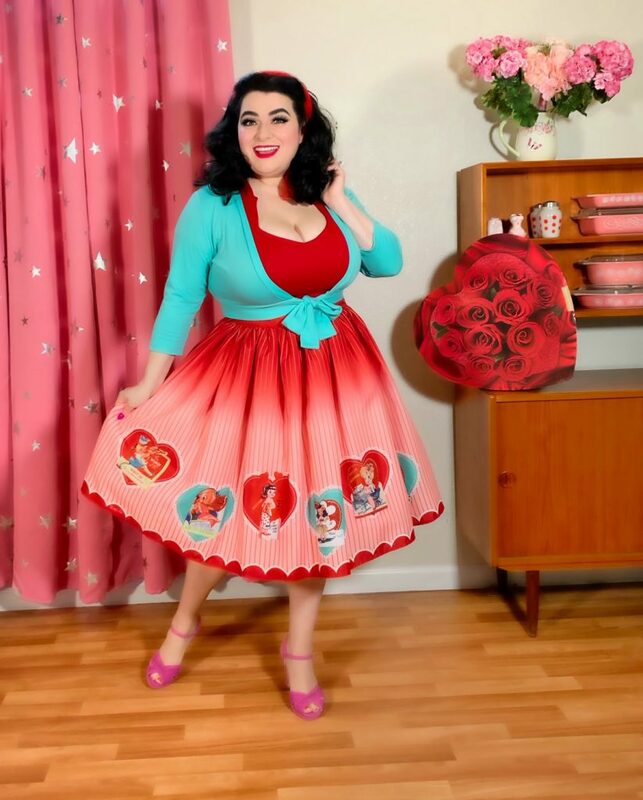 What better outfit could I wear then my vintage inspired Valentines Day circle skirt and my ruby red sweetheart top!! I love the combination and the way my hubby shot the outfit. 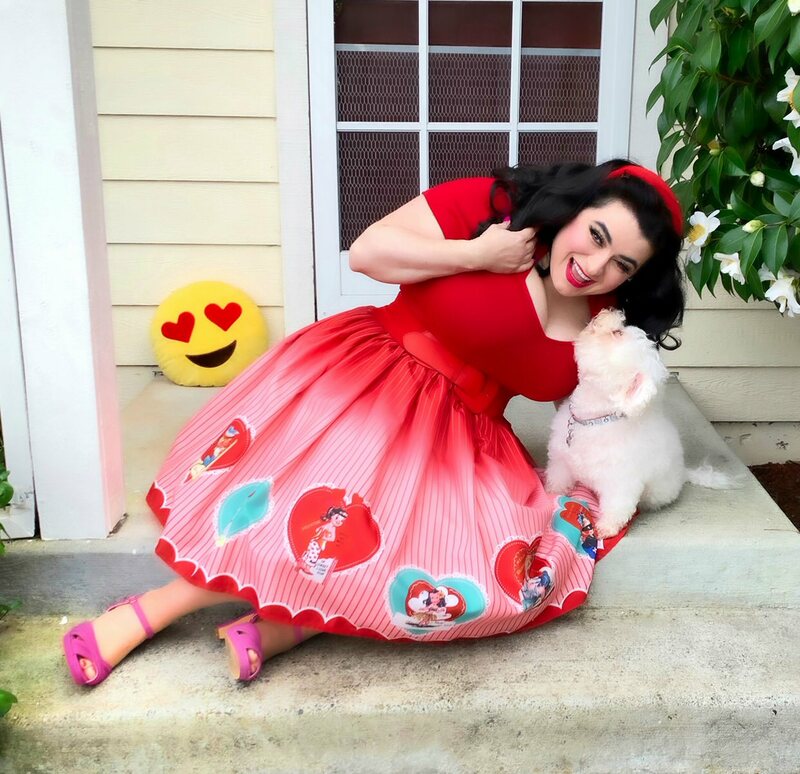 I added a fluffy pink petticoat for lush fullness under my skirt and wore my pink shoes along with adding my sweet sweater that goes perfectly with the novelty print of the skirt. Even our Mid-Century Modern set was all ‘sweet and love’ inspired from the pink drapes to the vintage pink Pyrex!! Red roses, pink flowers, and heart-shaped box of chocolates. Love was definitely in the air for our Valentines Day photoshoot. 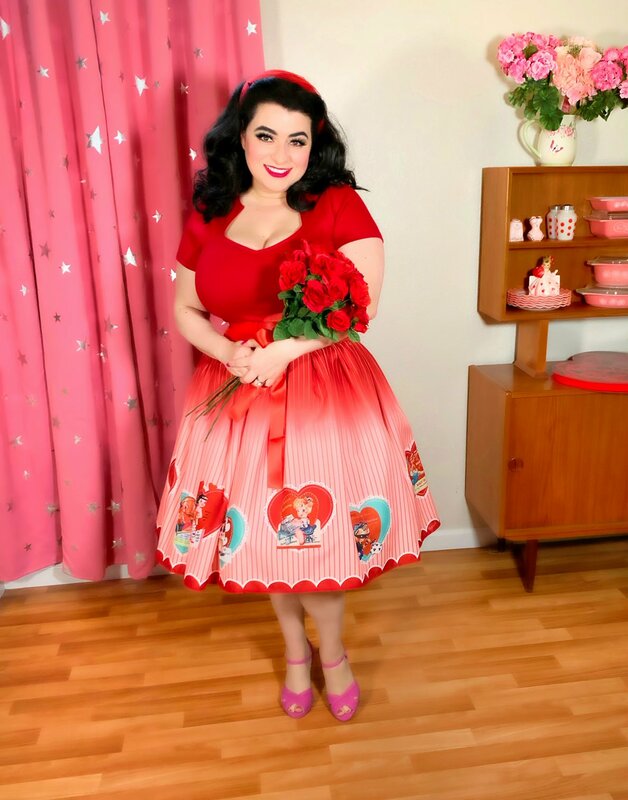 If you are in a relationship or single, Valentines Day is the perfect day to get dresses up in a fun outfit and go out! !